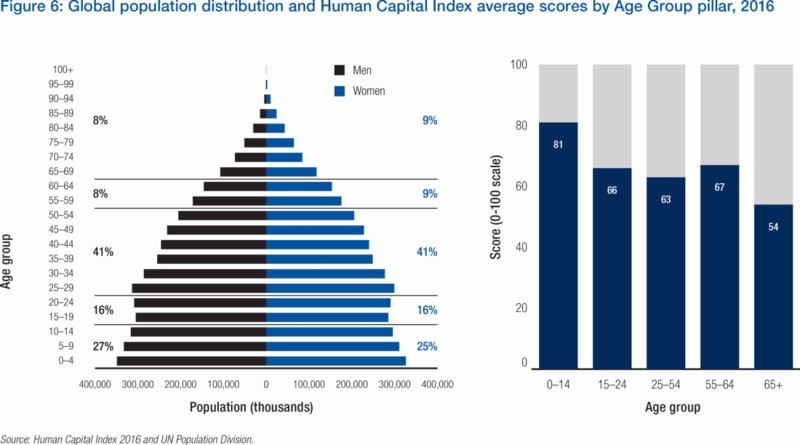 Going beyond national population averages, our data highlights the unequal development and deployment of human capital across the age-group spectrum (see Figure 6). On average, the world has developed 81% of the human capital potential of the youngest members of the global population for whom the Index assesses education among the most critical factors. This is in line with recent massive investment pushes in this age bracket—such as the former United Nations Millennium Development Goals and UNESCO’s Education for All agenda—and places the 0–14 age group significantly ahead of other parts of the global population with regard to its realized human capital potential. However, in the 15–24 age group, for whom the Index emphasizes factors such as workplace relevant skills and a successful education-to-employment transition, countries have on average only leveraged 66% of young people’s human capital potential, pointing to a disconnect between learning and employment in many economies around the world. Moving on to the next stage within the Index’s life-course approach to human capital analysis, countries on average only make use of 63% of the full human capital potential of their 25–54 year-old prime working age population. As discussed above, at the regional and individual country level, there is, however, a wide divergence around the world in human capital outcomes for this age group, for whom the Index emphasizes continuous learning opportunities in the workplace and employment quality. High-performing countries, such as the Nordics and Switzerland, have maximized more than 80% of the human capital of their prime age population; 16 countries in the Index have yet to cross the 50% threshold. Finally, the world’s older workforce—for whom the Index assesses both continued opportunity and health and quality of life—is the most underinvested-in segment of the global population, with human capital optimization ranging from 67% on average in the 55–64 age group to only 54% on average in the 65 and over age group. Our analysis shows that—in addition to measures such as bringing young people into work and preparing the next generation of workers in countries with high youth unemployment—human capital investment must also continue building up the human capital potential of the population above age 25 or risk neglecting, on average, 58% of a nation’s total talent. This is particularly true for advanced, ageing economies with a very different population pyramid from the young, emerging world. In fact, the declining share of the youth cohort in ageing economies implies that relying wholly on today’s students to meet future skills requirements of the Fourth Industrial Revolution is not going to be enough to stay competitive, since older age groups will continue to form the bulk of these countries’ workforces for a long time to come. With rapidly rising healthy life expectancies, life-long learning and re-skilling of existing workforces will become much more important. Equally important will be the removal of unconscious biases and unintentional disincentives against hiring and retaining older workers.10 Similarly, barriers to women’s employment throughout the life-course need to be addressed through both public policy, particularly an improved care infrastructure, and private sector efforts. 9 This is, however, a simplifying assumption, since countries’ exact population distributions tend to bifurcate into those that are ageing and those experiencing a “youth bulge”, with a small cohort of countries undergoing a demographic transition with the potential of a reaping a temporary “demographic dividend” (whereby the share of the prime working age population expands before the older age groups do so as well). In practice, the share of under 25 year-olds in our sample countries ranges from 68.2% in Uganda to 23.1% in Germany, while the share of over 65 year-olds ranges from 26.9% in Japan to 1.2% in the United Arab Emirates. For a detailed discussion of index construction and weighting decisions, please refer to the Technical Notes on the Report website. 10 Some companies are already operating in age-friendly ways. This includes recognizing the value of employees of all ages, creating working cultures that provide access to and sustain employees regardless of age, and keeping opportunities available and open for learning and mentoring. Many companies have also realized the market opportunities presented by longevity, in particular the tech savvy nature of the elderly and their participation in the digital economy.